May FLEW by, guys. Seriously, where has the time gone!? The one good thing about it being June already is that it means – yay!- only six more weeks of work to go until the summer holidays. Woohoo! Not that I’m going anywhere this year but still, summer!! I used up a fair few products, this month! Soap & Glory Heel Genius- I already have another tube of this on the go, it’s fantastic and helps keep my horrible and dry feet nice and supple. When it’s not too hot I like to slather this on and then put some slipper socks on over the top when I go to bed. MUA Undress Your Skin Flawless Primer- Likewise, already stuck into another one of these! It’s easily the best primer I have ever used, perfect for my odd, combination (but currently mostly oily) skin and keeps my foundation looking smooth and flawless. Glow by J.Lo- Annoyingly there’s still the tiniest bit left in here, but it’s more or less all used up! I want to hate celebrity fragrances but I usually don’t- I have two Gwen Stefani ones, Lady GaGa Fame and Taylor Swift Wonderstruck on my dressing table, ahem- and this was a pretty good one. It managed to be light and summery and also quite musky which is exactly the sort of fragrance I like. Not sure if I’d get it again, though. Batiste Oriental Dry Shampoo- What can I say about Batiste that you all don’t already know? It’s the best dry shampoo I’ve used, worth the extra pound or so you pay over an own brand. Oriental is probably my favourite fragrance, but I’m trying one of the floral ones now so we’ll see. Superdrug Intensive Hand Therapy- Nice hand cream, really. I get horribly dry hands so I have several different hand creams around the house and in bags. Pretty good value for money, and I probably will track this one down again when the time comes for a repurchase. Along Came Betty The Night Shift- love this cream. I switched to this after discovering Soap & Glory had discontinued my beloved Night in Shining Armour cream, and it’s fantastic. If they have discontinued this I will cry, but I’m on my back up tub now. Good Things Fresh Start Creamy Cleanser- I love this. I used to be a dyed in the wool Peaches and Clean girl, but this is so much more gentle on my face- no redness at all after using this!- and it gets rid of pretty much every scrap of makeup. It’s gentle enough on my skin to double cleanse, too. I’m actually using a different Good Things cleanser now- the Deep Cleanse one for oily skin- but I wouldn’t hesitate to get this one again. Soap & Glory Righteous Butter body lotion- this little sampler was from when I was more or less homeless (have I told you that story? Don’t think I have…) and I’ve only just used it up because when I got back in my room I was able to use my giant bottle of it again! P.S. Love nail varnish remover- the budget dupe of the Bourjois 1 Seconde remover, this works just as well and somehow doesn’t feel as harsh on my fingers or nails. Sure it’s not gentler because it’s so much cheaper but never mind! 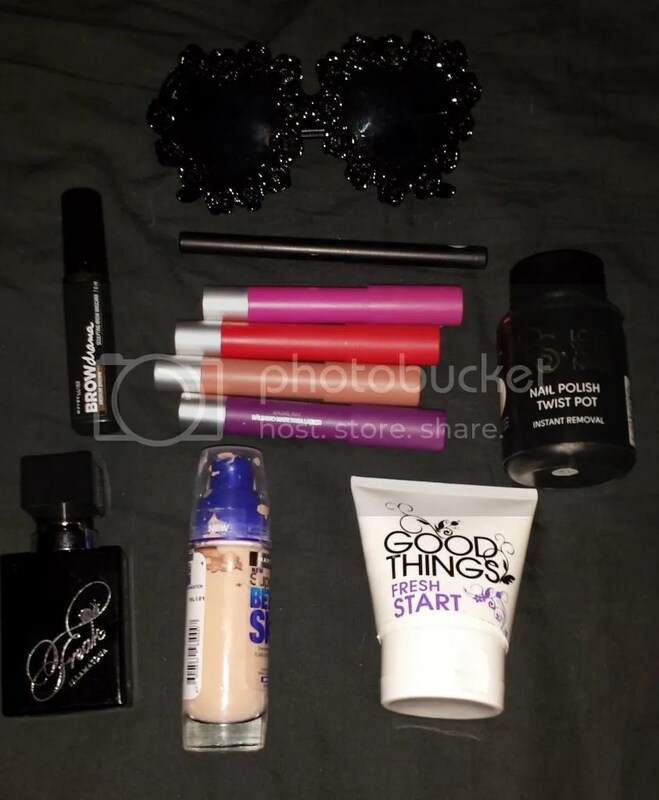 Lots of beauty and sunglasses are this month’s picks! Primark black rose sunglasses- I tried these on when my mum and I went to London last month, but I put them back again because I chickened out. Well, I saw them again in my local Primarni earlier this month and decided it was fate. They make me feel like a total diva, an eccentric fashionista and I love them! They probably look hideous on my round face but dahlink, I just don’t care! P.S. Love felt tip eyeliner pen- Discovery. Of. The. Year. This felt tip pen, for £1.50, is a total bargain. I might do a ‘pen liner’ comparison post, but whilst I’m not sure if it’s better than Soap & Glory Supercat, the price makes it just astounding. It lasts all day when I wear it, it’s so very black, and it’s so easy to apply. It makes lining your eyes a veritable piece of cake. Maybelline Browdrama Sculpting Mascara in Medium Brown- Well, this was probably an obvious choice. I think I pretty much wear it every day, with or without a pencil underneath. Tempted to buy the darker colour when I need to repurchase, but honestly this one works so well I might just stick with it. Revlon Matte Balms- These may be some of my favourite High Street lip products EVER. I LOVE them. The formula, the colours, the pigmentation, the wearability- everything! I have Complex, Showy, Shameless and Striking and whilst I’m tempted to get a few more colours, I’m happy with the selection I have. LOOOOOVE. P.S. Love nail polish remover- Like I said in the empties bit, this is the cheaper version of the Bourjois remover and I think it works just as well. It’s bargainous, it smells and feels nice on me ol’ digits, and it makes my weekly nail routine that much quicker and hassle free. Illamasqua Freak perfume- I’m a perfume girl, but I don’t think I’ve talked about it much on here. This is a perfume I have loved since my first whiff of a test at the Illamasqua counter a year or so ago but have only recently acquired in a sale because it’s fairly pricey. But I love it. It’s quite intense, with top notes of Black Davana, Opium Flower and Belladonna, heart notes of Poison Hemlock, Datura and Queen of the Night blossom and base notes of Frankincense, Oud and Myrrh. Maybelline SuperStay Better Skin in Light Beige- Another one you probably saw coming, huh? This may be my Holy Grail of high street foundations. The colour match is bloomin’ impressive, the coverage is just what I’m after, and the way it looks and lasts on my skin is unlike any other foundation I’ve tried. I still use my other foundations and will probably still try others but I can predict that I will always repurchase this when it runs out. Good Things Fresh Start Creamy Cleanser- I won’t say too much about this because I rambled on about it in my empties section but needless to say, it has replaced my beloved Peaches and Clean in my heart. I still have a bottle of P&C to use up in my drawer but I’m thoroughly impressed by the Good Things range. I’d also like to include both Chvrches and Turisas on my favourites this month, as I have been switching between their CDs in my car! Have you used any of my favourites? What are your picks for May? 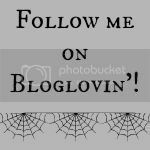 This entry was posted in Beauty, Hair, Makeup, Fashionista Musings and tagged Along Came Betty, Batiste, Browdrama, empties, Favourites, Good Things, Illamasqua Freak, J.Lo Glow, Maybelline, MUA, P.S. 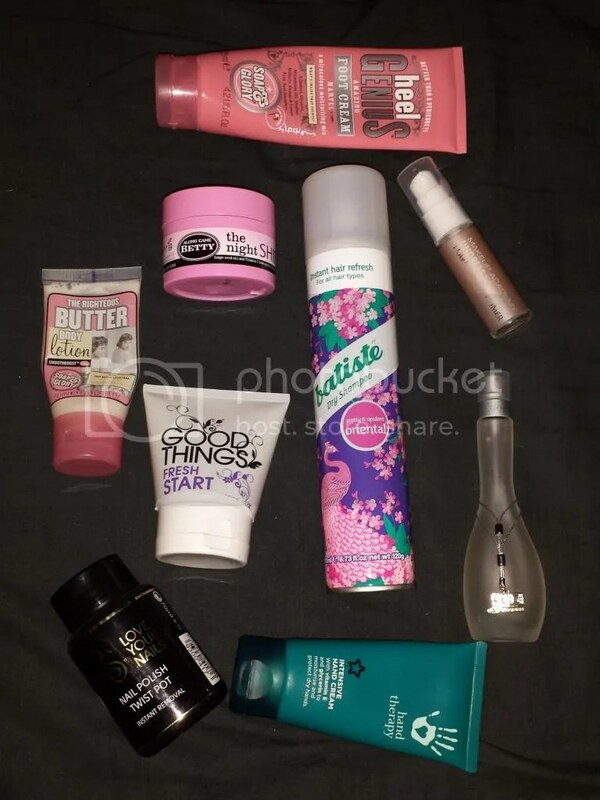 Love, primark, Revlon, Soap & Glory, SuperStay Better Skin. Bookmark the permalink.